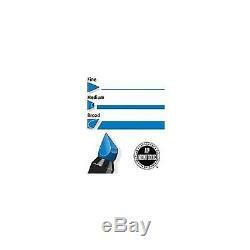 Chartpak AD Marker Set with Caddy (100 Pack). Non toxic and solvent based. Do not streak or feather. Ideal for artistic use on traditional and non traditional surfaces such as paper, acrylics and ceramics. Country of Manufacture: United States. Set contains: 100 colors: Apple green, aqua, aquamarine, banana, basic gray 5, beige, black, blue green, blueberry, blush, brick red, bright orchid, buff, burnt sienna, burnt umber, cadmium orange, cadmium red, cadmium yellow, celery, chartreuse, chrome green, chrome orange, cobalt blue, cool gray 1, cool gray 2, cool gray 3, cool gray 4, cool gray 5, cool gray 6, cool gray 7, cream, dark mint, dark olive, dark yellow, deep evergreen, deep magenta, deep salmon, desert tan, dutch blue, electric blue, evergreen, frost blue, goldenrod, grass green, ice blue, kraft brown, leaf green, lemon yellow, life red, light flesh, light sand, lilac, linden green, maize, maroon, mauve, mint, mocha, naples yellow, navy blue, nile green, olive, pale cherry, pale flesh, pale indigo, pale lime, pale olive, pale yellow, palm green, peach, pink, powder pink, process blue, prussian blue, purple iris, purple sage, redwood, ruby, salmon, sand, sapphire blue, scarlet, sepia, sky blue, sunset pink, suntan, super black, true blue, turquoise green, ultramarine, violet light, warm gray 1, warm gray 2, warm gray 3, warm gray 4, warm gray 5, warm gray 6, willow green, wine red, yellow green. Overall Product Weight: 7.8 lbs. And we will work with you to resolve it to your satisfaction. 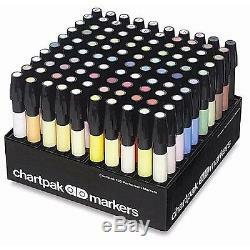 The item "Chartpak AD Marker Set with Caddy (100 Pack)" is in sale since Wednesday, August 10, 2016. This item is in the category "Crafts\Art Supplies\Drawing\Pens & Markers".smarter" and is located in US.